Blackjack is one of the most popular and well known casino game that has miltiple variations. Blackjack is a game of skill & chance between a player and the Dealer. Microgaming casinos offer Spanish Blackjack game also called Spanish 21 that is played with 8 unique decks of 48 playing cards made up of the standard 52 cards, less the four 10 (Ten) cards. Each deck is shuffled before every game. Although removing 10s from the decks moves the odds in favor of the casino dealer, other favorable rules compensate the lose and made Spanish 21 to be the game with ones of the best odds for blackjack. A player's 21 always wins, i.e. players Blackjack beats the dealer's Blackjack. A player's blackjack pays 3 to 2. A player's blackjack beats a dealer's blackjack. In other blackjack versions, this would be a push, or a tie. A player's 21 beats a dealer's 21. This would be a push in other blackjack games. Surrender is allowed. You can salvage a bad hand by saving half your original bet instead of losing your entire bet. A player may double down on any number of cards. In most other blackjack games, you may double down only on your first 2 cards. A player may re-double down. Re-double is unheard of in other blackjack games. It gives you a chance to really win more money with a good hand. A player may surrender after doubling down. If your double down doesn't work out as planned, you can surrender your regular bet rather than risk the loss of your doubled bet. A player can split 3 times to make four hands, and can double down after a split. Spanish blackjack has some of the most liberal splitting rules of any blackjack table game. Unlike 10-value cards can be split. Aces can be re-split, and you can draw and double down to split Aces. The object of Blackjack is to beat the Dealer by either obtaining the highest possible hand (without exceeding 21), or by making the Dealer's hand bust. In this version of Blackjack (Spanish), you can only bet one hand at a time. All face cards (i.e. Kings, Queens and Jacks) have a value of 10 and the Aces can have a value of either 1 or 11. Please refer to the basic blackjack rules to learn more about the general game terms and rules. Insurance is not recommended in Spanish blackjack. The strategy shown below will help you decrease the house edge up to 0.38% or even a bit less with card counting. The strategy was developed by Jeff Wu - professor in ISyE and the Coca-Cola Chair in Engineering Statistics. Note: the strategy requires you to Hit when you have 16 or even 17 with three or more cards against the Dealer's Ace that looks very strange. However, the strategy is correct and you need to follow it exactly if you want to have the best odds. The absence of the 10-cards from the Spanish blackjack decks, and the special Spanish blackjack rules and bonuses for players, have profound effects on the optimal Spanish blackjack strategy. 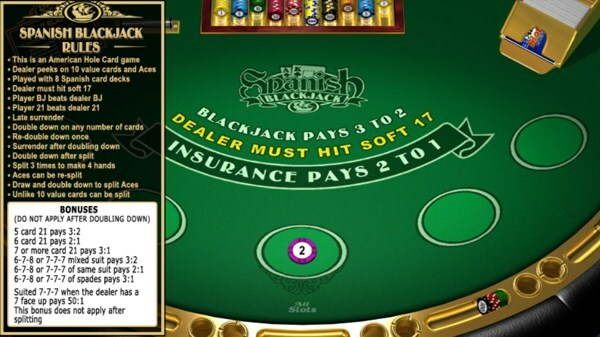 As a result, a standard blackjack basic strategy chart would not be relevant to a game of Spanish blackjack. Use the special Spanish blackjack strategy charts above to get the best odds. The strategy card can be downloaded and/or printed. 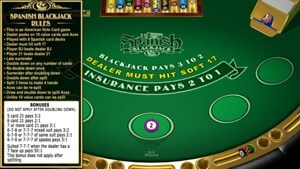 Today most of the Microgaming online casinos offers over 30 different versions of Blackjack including: Atlantic City Blackjack, European black jack, Spanish 21, Multi-Hand, Double Exposure, Perfect Pairs European Blackjack Gold Multi-Hand, Vegas Strip, Vegas Downtown and Triple Sevens progressive blackjack (the complete list of the games can be seen on the left or top bar menu).